If you have the space, plant a treet. Can you name these persimmons? They are not good until they be rotten," is how Thomas Harriot, an Englishman who lived in the Roanoke colony of Virginia in 1580s, described the persimmon, one of the fruits least appreciated by American consumers today. "They are as red as cherries and very sweet," he observed. "But whereas the cherry is sharp sweet, they are luscious sweet." Luscious sweet they are, and persimmons are also the tree crop most associated with the cold of winter. Both the native American variety, which ranges from the East Coast to Oklahoma, and those bred from stocks that originated in China, begin as tiny green button-like flowers that slowly mature into fiery orange pods. The mature fruits dangle from gnarled and weeping branches like bright ornaments. If they aren't picked, they'll hang there late into December and January, long after the tree has shed its leaves. The persimmon has always been a festive holiday fruit enjoyed by people huddling inside from the snow and ice. They're often the sole spot of color in gray landscapes. The astringency and hardness of an unripe persimmon always gives way to a soft and rich flesh that oozes like custard or jelly. Before modern supermarkets and the agribusiness industry established the supremacy and year-round availability of apples, bananas, and oranges, the persimmon was a common fruit found on tables around the New Year. Persimmons used to be ubiquitous in breads, porridges, and even beers. The Swedish-Finnish botanist Pehr Kalm, who visited the eastern coast of North America in the mid-1700s, observed the production of persimmon alcohol using "loaves" of mashed fruit mixed with grains that were baked and later boiled into a wort. He remarked, "Beer thus prepared is reckoned much preferable to other beer." In the South, persimmon alcohol was known as "possum toddy," a name derived not from the marsupial mammal, but instead from the Algonquin words "pos," to choke, and "men," which means fruit. It's believed that word persimmon is another version of these native words. 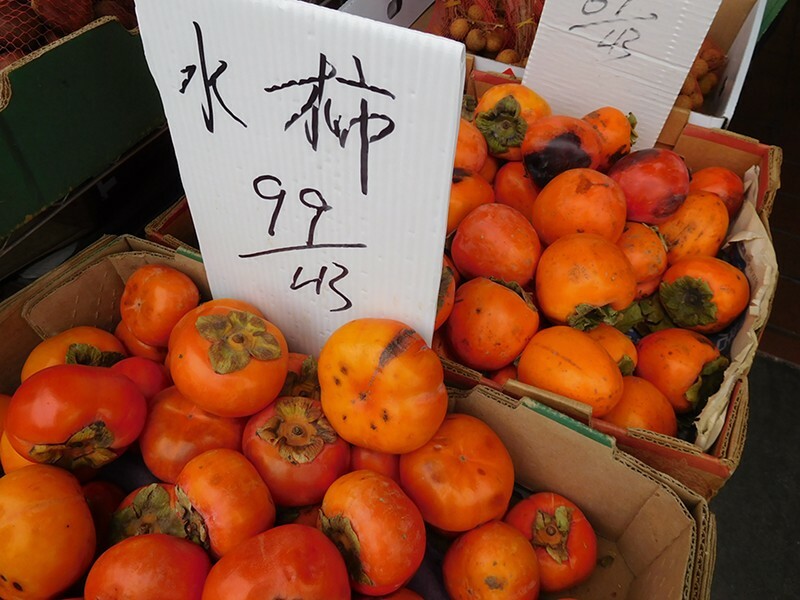 Nearly all the persimmons available today in East Bay farmer's markets and produce stores are derived from Chinese and Japanese varieties, not the native American choke fruit. California is by far the biggest producer of commercial persimmons in the United States, owing much to Chinese and Japanese farmers who brought scions and seeds here in the 19th and early 20th centuries, and spread their cultivation up and down the state. Ranging from ten to fifty feet or more in height, persimmon trees can either fit neatly in a backyard's corner, or overshadow a lot. Their wood is hard and dark, resembling the ebony tree, which they are closely related to. While much larger in size, the Hachiya persimmon of Japan shares the same basic qualities as the American species: They're astringent until they suddenly turn soft and flame-orange. Hachiya, which can be found in almost every Chinatown market stall, or in grocery stores such as Berkeley Bowl and Farmer Joe's, are big-bodied fruits shaped like fat acorns. They make excellent puddings, and once ripe can be frozen and eaten with a spoon like a sorbet. Hachiya also make the best hoshigaki, the dried whole persimmons that are traditionally gifted in the winter. Hoshigaki is a delicacy that is still hard to find in stores, even in the Bay Area, but that doesn't matter because they're best experienced as a craft project. To make Hoshigaki, you take whole Hachiya persimmons, skin the fruits and hang them on strings by their natural stems in the sunlight and wind where they can dry and ripen all at once. They need to be hand massaged over several weeks as they desiccate. Eventually they can be moved indoors to a dry, warm area to finish dehydrating. The result is a thick, candied morsel frosted with natural sugar crystals. Sliced, the flesh resembles boiled beets and translucent citrus zest densely packed with glittering pockets of fructose. The Hachiya tree is prolific in California. Many gardeners cultivate this variety in their yards for its beauty and crop. The Fuyu is probably the second most common variety grown in the Bay Area due to its tolerance of the region's moderate climate. Fuyu are among the non-astringent varieties of persimmon that can be eaten straight from the tree while still hard as an apple. But there are literally dozens of other persimmon varieties for those who want to plant a tree. 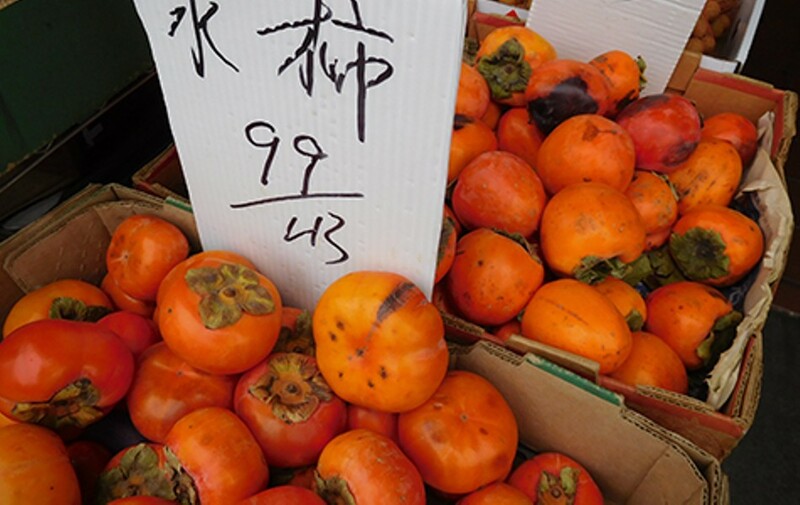 They include the Chocolate persimmon, prized for its brown, spicy taste; the Saijo, which looks like a big Roma tomato; or the Sheng, distinguished by its flattened, four-lobed shape. And plant a tree you should, for in order to taste anything besides the Hachiya and Fuyu varieties requires growing your own due to the persimmon's continuing rarity in American supermarkets.